This combo tour, to be completed over the course of two days, pairs a scenic wine tour of Napa and Sonoma Valley with a 1-hour boat cruise of the San Francisco Bay. 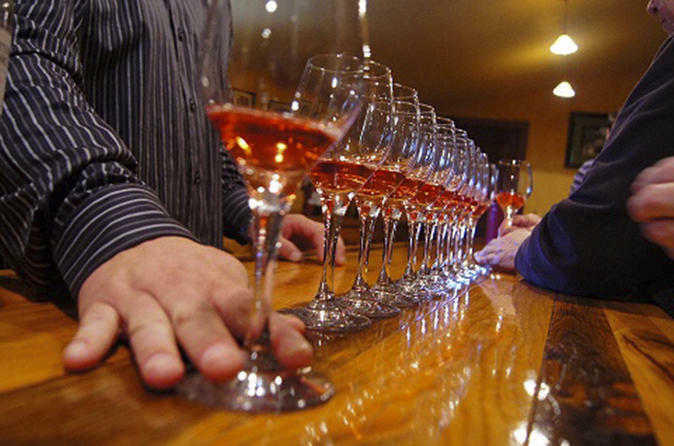 First, enjoy a day of wine-tasting as you tour three different wineries. Then, see the best of San Francisco's skyline as you sail underneath the Golden Gate Bridge and around the world-famous Alcatraz Island on a cruise the following day. NOTE: Tour to be completed over 2 exciting days! Unwind and soak up the stunning scenery as we journey north into Napa and Sonoma Valley, two of the most prized wine regions of Northern California. During your venture, enjoy wine tasting and exclusive estate tours of three of our favored wineries: Madonna Estate, Sutter Home, and Sebastiani Vineyards. Since 1922 the Bartolucci Family has consistently created a perfect marriage of grapes and wine at Madonna Estate. Located in the world-renowned Carneros region, an area known for its fertile lands and cool climate, the Bartolucci family has found success with their organically grown grapes and Estate Bottled wines. In addition to practicing natural farming methods, they also combine traditional and modern wine making techniques. As the third oldest wine making family in the Napa Valley, it is important to them that they continue the commitment to farm naturally and preserve the wine making traditions of past generations. When the Trinchero family bought the Sutter Home Winery in 1948, they had a vision, a passion, and apparently, an insight into consumer tastes. In the early 1970s, Sutter Home started a trend when the company created White Zinfandel, introducing a new, sweeter flavor profile. They changed the way Americans enjoyed wine by offering them high-quality varietals at an affordable price. By the 1980s and 1990s, Sutter Home became a household name and the second largest independent family-run winery in the United States. During a lunch break, we'll make a stop at the Historic Downtown Sonoma Square where you will enjoy leisure time to explore. The destination afford a wonderful variety of eclectic dining options and one-of-a-kind boutique shops and local art galleries. With over a century of wine making experience in Sonoma, Sebastiani Vineyards & Winery focuses on crafting small lots of premium wines from Sonoma County. Today, Sebastiani Vineyards & Winery advances its record of acclaim under the guidance of vintner and entrepreneur Bill Foley, who acquired the winery in 2008. As part of Foley Family Wines, Sebastiani will maintain its commitment to producing singular wines from the appellations of Sonoma County. NOTE: This combination tour package is to be completed over the course of 2 days.